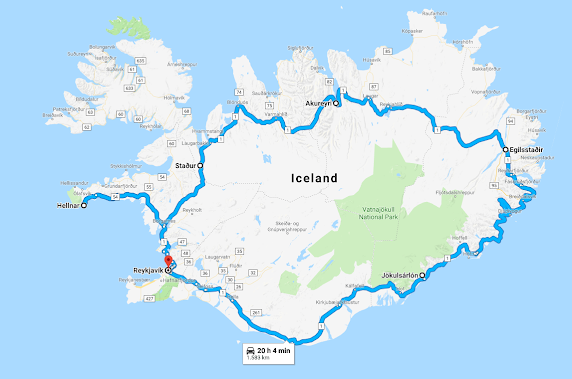 Road trip through Iceland with an RV. Often we tell people that we regret that we have visited Iceland already, because it feels like this will be one of our best travels ever, and it means we already had it. Nevertheless, on the other hand, Iceland is getting every year more and more tourists, and we were glad to experience it rather before the big crowd discovered it. We heard and read a lot about the golden circle, a popular tourist route in Southern Iceland. It clubs a lot of interesting phenomenons to see, but as it’s close to the airport, it has been exploited, and it’s the place where you see the most tourists. We still advise you to discover it, you won’t regret it, and we were glad we took it a the beginning of our trip, not at the end. We made a parking reservation with sky park in Hoofddorp which was € 60 for 12 days parking. A convenient shuttle took us right to the departure hall of Shiphol. We booked a flight with Iceland Air and flew from Amsterdam to Reykjavik. We took a cheaper flight which was landing at 22:45 in Iceland, but I would change that next time. When you arrive late, you can’t pick up your RV. Which made us taking an expensive taxi to a nearby hotel and take back a taxi in the morning to pick up our RV. At the end this was slightly more expensive than taking a flight during day time. This is something to take into account when you book your flight. Cheap does not always mean convenient. When we arrived at the airport, and found our reserved taxi driver, a bit cheaper if you handle this upfront, and while walking towards the car we were already treated on some real polar light! This made up the extra hassle we had for not being able to pick up our RV. Airport Inn: The first night we slept in Airport inn where we paid € 59 for a short night, as we only arrived after mid-night. The hotel has a self check-inn and the room was all we needed. At 09:00 in the morning we could pick up our RV and our Iceland road trip could start. We started our journey by following the only highway in Iceland; Highway 1. Our first stop was Thingvellir National Park. It was a nice starter of our trip. We spend around 1 hour and a half to discover the main interesting parts. They are only few minutes walk away from the entrance. 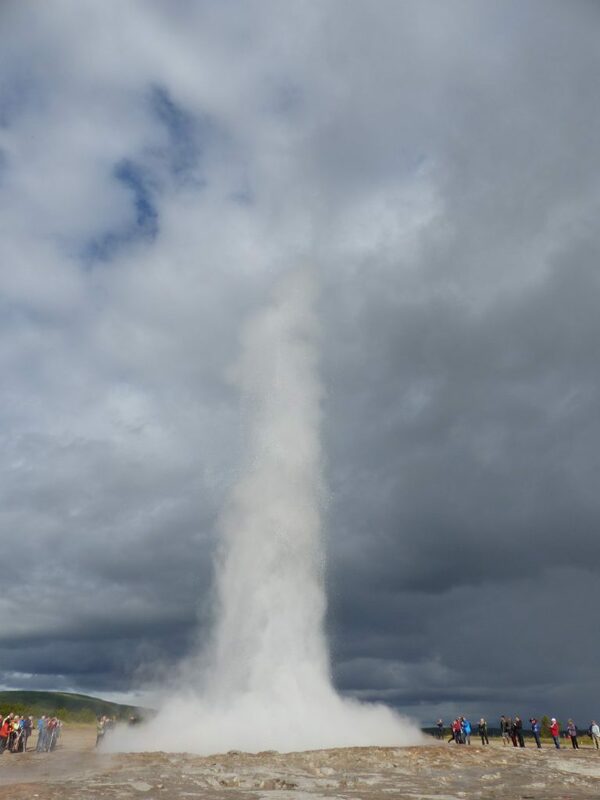 We continued our trip further to Geysir. It’s a very special phenomenon. Every x minutes it bursts water up to 20 meters in the air. You gather around it with lots of other people, just waiting for it to burst. You see the water bubbling on the surface, and then suddenly it shoots up. Hard to predict and the waiting and hoping it happens is nice. We continued our journey towards Gullfoss (Golden Falls) a very iconic waterfall and very popular, so as you can guess, you won’t be alone over here. Nevertheless, you have spots enough where you can take the perfect picture. While heading towards Kerid, we decided to take a small detour for the Skalholt Cathedral. Seems other tourists don’t think it’s worth the effort, as we were completely alone at this place. it’s rather a church according to us, and you won’t spend longer than 10 – 15 minutes over there, but it was to experience the silence. As said, we continued towards Kerid and this was the only place where we had to pay entrance. It costs 2€ to enter. There was a guy in a very small office that collects the money. As all other places in Iceland are free, we still often think the guy invented his own way of making some money 🙂 Kerid is a volcanic crater lake and the caldera itself is 55 m deep, 170 m wide and 270 m across. we took the effort to walk around the crater and also went down, to the water. We ended our day with our RV and decided to park and sleep in Hveragerdi and go early days to the hot springs. We got up around 06:00 and left immediately for the hot springs. The walk towards the hot springs is medium hard. Certainly that early in the morning without breakfast. It keeps on going up. We red somewhere you will think 5 times that you are going in the wrong direction and that is correct. But by knowing that, we kept on moving forward. Eventually, after about 45 minutes (I think) we arrived there. Most pictures or reviews show or talk about a lot of people, and we were lucky to be the only ones due to our early departure. It was still cold in the morning so taking out your clothes is not that enjoyable, but the reward greatly compensates the feeling. How higher up the stream the warmer it gets. It’s up to you to choose where you will be sitting or lying in the river. We really enjoyed the moment and till date this memory is still in my top 5 of travel moments. After 1 to 2 hours we headed back and on our way we saw the first people going up. After our hot spring visit we continued our journey toward the Lava Tunnel, also known as the Split Mound Cave. I think I read on the internet that nowadays you can only visit it with guided tours. Not sure if that’s true. When we were there, we could just enter and explore it ourselves. You have to be careful as the rocks can be slippery and the deeper you go, the darker it gets, so don’t forget your torch. Also a cap and gloves might be good idea for cold people. We spend around 1 hour going in and back. As we were alone that deep in the cave, we didn’t over do it. You don’t want to take risks by doing things you are not familiar with. 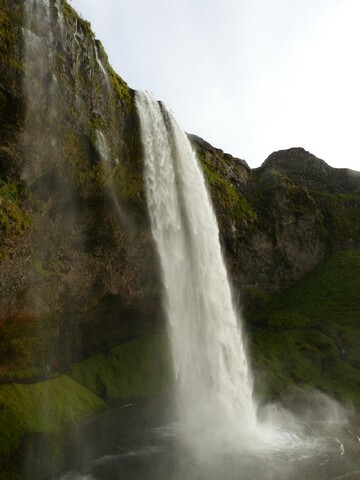 We continued on the ring road towards Seljalandsfoss which is a marvelous waterfall and the best thing is that you can go behind the waterfall, but we recommend to have some rain clothing at hand, as you will get wet if you stay there quite some time. This is again an example of how easy it is to see the nature wonders of Iceland, as this waterfall is about 450 meter away from the ring road. As you noticed by now, it’s really one incredible nature creation after the other. It’s a busy day and all of them are convenient close to the ring road. As the day passed on, we continued towards Vic where you can easily reach the beach which is colored magnificent black. It has a threatening sight. You can see some huge rocks in the sea as well. We were lucky to be there near the evening an we saw a very beautiful sunset and while the sun was going down wen continued toward the basalt columns at the beach. They are really funny to sea and we recommend not to miss them. As it’s not allowed to stay the night on the parking and it was close to become dark, we spend the night on the parking lot of the church nearby. We had an RV for a reason and it was nice to spend the night alone in such an area. As we could not camp on the parking at the beach we turned around and headed back to the main road. Soon we saw a church in the middle of nowhere and we decided to park our RV and stay the night on the parking in front of the church. After our night at the church we again continued our journey quite early and we decided to take breakfast near Systravatn Lake. You only have 1 or 2 catering places and in one of them we took a breakfast and coffee before climbing up to the Systravatn Lake. It’s an average climb and again anyone with average health condition should easily make it up to the lake. As we were early we were alone and could enjoy the views and the lake in all it’s peace. We red upfront on the internet that when you drive on the ring road the views change every x kilometer and you think you are in another country. We thought it was exaggerated, but it really is not. It is hard to follow how quickly it changes. A little before noon we reached Skaftafell National Park where you can make a walk towards Svartifoss. From there you can continue for a loop walk to the glacier. In total it was 18 km and took us 3 hours and a half. It’s quite intensive, but again with an average condition and some time you can easily make it. When you walk like us, clockwise, you reach the glacier at the end, which is nice as a reward. Make sure you have different kinds of clothing with you, as the weather changes quickly and also make sure you have water with you. When you finally reach the glacier you can see where it stops and goes into the river. When you continue the walk and get closer to the water, you will see some big ice rocks. From there, once again, we continued our journey and we arrived in the late afternoon at Lake Jokulsarlon and the place is really amazing. The big ice rocks are just floating on the lake, some still having ashes from the 2010 Eyjafjallajökull eruption. It further makes it special that this lake was used in two James Bond films. It was used in A View to Kill (1985) and also in a spectacular car chasing scene in Die Another Day (2002). We also saw a cute seal swimming in the lake. After we went to the other side to see some ice rocks drifting in the sea. Don’t forget to take a look at this side. Some of the blocks had stranded on the beach. There was a lot of wind and it was quite cold, so make sure you are clothed appropriately. We spend the night on the parking lot near the lake. Before our travel started we booked a boat session on the lake. You have a big group boat and a zodiac variant (small group and more expensive). In the morning we learned that due to earlier weather and wind the boats could not go in the morning as the rocks were blocking the start zone. We could easily reclaim our money or wait till later that day. We took first option and were quite happy we didn’t have to go on the boat tour. It’s very touristic and we don’t think you would get such a better view of the ice rocks. Continuing to follow road 1 we crossed a small village Djupivogur, where you have some big granite eggs. They are good for a few pictures, but if you don’t have much time you can easily skip them. While driving further, you come to the part of the ring road which has no asphalt yet. In combination it goes steep uphill and later off course downhill. I think the gradient goes up to 10% and although it went smooth with our RV we were glad to reach again the asphalt part so we could speed up again. Nevertheless the views are magnificent. Going forward we had read on the internet that you have some nice authentic villages in the eastern part of Iceland. We left the ring road and took road 93 towards Seydisfjordur. It was a steep hill up and then a steep hill down. Once again we didn’t enjoy this too much with our RV although there were some nice colored houses and church in the village we thought it was rather average. Going there and return took easily 2 hours and unless you have plenty of time, we recommend to skip it. While the day was coming gently to an end we decided to drive towards Dettifoss which was still a bit to drive, but insurmountable. We followed again the ring road till we had to turn right on the 864. We were getting close to the waterfall, we thought, as the road was not an asphalt one, but with grid which you see a lot in Iceland. We still saw people coming from the waterfall in the opposite direction. We think that part of the road till the waterfall was about 30 km. In the beginning, the first few kilometers it was still doable, but as of then the road was in really bad condition. In meanwhile there were no more people crossing and the night started to fall with a lot of fog. We could mostly not drive any faster than 30 km/h with our RV. This makes that it took us yet another hour where we thought to be close to the waterfall. You seriously want to take this in consideration, certainly with an RV. When we finally made it to the waterfall parking lot, we heard the waterfall but the road went quite steep down. As we remembered that our RV can’t take everything uphill, and it was in meanwhile to dark to see much further, we decided to park and to stay the night on the first parking lot. After a few kilometers on road 85 we reached Asbyrgi which is a glacial canyon in the form of a horse shoe. We first got some information in the visitor center and then hiked up the hill in the beginning of the park, which is called “Eyjan”. It starts from the camping site and from up there you can overlook the canyon of Asbyrgi. This medium hike is not a loop, so you have to return the same way you went up. It total it will be around 5 km. From the camping side we drove deeper inside the park towards the Botnstjorn pound where you have several smaller hikes which we recommend to do if you have time for it. You can go close to the water, and at some place it’s really at the foot of the canyon, which makes the view very nice. We continued our journey towards Husavik where we arrived in the afternoon. We thought to do the whale watching tour the next day in the morning, but we were right in time to ship on the latest whale watching boat tour of the day. We booked our tour with North Sailing and it was not cheap but worth every penny. We saw 4 different kind of whales and we got a very good look at a Humpback whale. In the return on the boat we got hot chocolate and cinnamon rolls. Make sure to dress well, as it was very cold out there. We got special overcoats to handle with the cold. At first we were much busy with our camera to take the perfect picture, but we recommend to look around and to enjoy it yourself. You have to be quick to see them. Once we left our camera for what it was, we saw them even better. At first we planned to stay on the camping site of Husavik and visit the Whale museum the next day, but as we were end of season the opening hours were limited. I think the museum only opened at 10:00 and as we are not museum people, we didn’t want to be waiting for that in such a small city half of the morning, so we decided to move on and started to drive in the direction of Myvatn by taking road 87. After a little while the road stopped being asphalted and thinking back to our Dettifoss experience we thougth the worst, but we were lucky. The road in gravel is very decent. A little later we arrived at the cross point with the ring road and we stayed for the night on the parking next to the road. In the morning we started by visiting Grotagja which is nowadays in private hands but you can still visit it. It’s a natural hot spring but you are not allowed to bath in there. The cave is famous from the series Games of Thrones. In the afternoon we split our activities, in a slightly less traditional way. In stead of the wife that goes to the wellness it was the other way around. Tom went for wellness in Myvatn Nature Baths. This is the answer from the northern region towards the famous Blue Lagoon near Reykjavik. Having visited them both, I would recommend the one in Myvatn as It’s the same principle after all, but way cheaper, less touristic and thus less people. You can park close by the entrance, go in quickly and hit the warm water. You should not see this as a swimming pool, so after a good hour the most fun was out of it. Luckily they have a sauna as well, so you can swap between the both. Although the weather was not great Marie-Claire went horse riding on a traditional Icelandic horse. After being spoiled several days with beautiful waterfalls, you kinda get used to it, and we started to skip some here and there. We almost skipped this one, but we are glad we took some time to visit Godafoss. 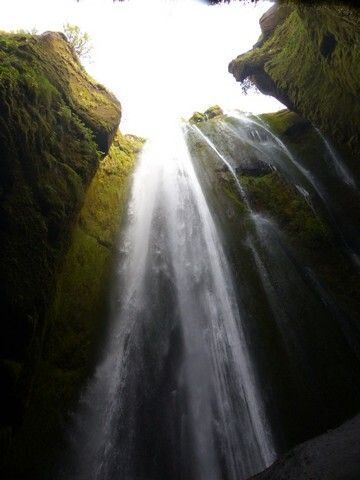 After all it is named waterfall of the gods. It’s definitely worth some of your time. 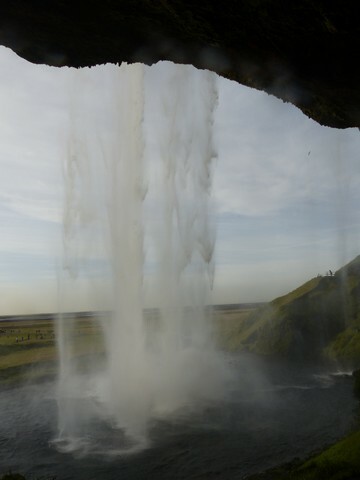 In fact you have the main Godafoss waterfall and also the Geitafoss waterfall which is a little down stream. You can admire the Godafoss from on top or down to the water if you cross the bridge. You can also see quite some nice basalt columns present near the water. We enjoyed this waterfall as it came very unexpected and spent quite some time over here. After we continued our journey towards Akureyri and decided to stop for some fish & chips in the Akureyri Fish and Chips restaurant. We order at the desk and waited till our dish was ready. The restaurant was cozy busy and the food tasted well. The bill was affordable and we can recommend this restaurant. As we did not find any spot that we liked to stay the night, we decided to drive a little bit and search to stay the night somewhere on a parking lot along the road. As we left, the road was quite busy and we really did not find any spot which we thought was safe enough to park for the night. As it often goes, you don’t find anything when you need it, and thus we spend more than 1 hour to find a suitable parking to spend the night. It was really in the middle of nowhere where camping was not allowed, but we again saw parking our RV not as camping 🙂 And as it was getting dark, we wanted to park for the night. It was a lucky choice as we were really in the middle of nowhere and later on the evening before going to bed we were treated on some nice northern light. It felt a bit as a reward for driving that far. Enjoying our drink we stared up the sky which was clear and as we were in the middle of nowhere, we were not bothered by city lights. In the morning we visited the Vioimyrakirkja Church which is from the beginning of the 20th century are service is still held. After that church we visited the Pingeyrarkirkje which is the first stone church of Iceland, built in 1877. As the weather was not that good and we had some rain, we decided to visit the Bjarnarhofn Shark Museum. It’s a small family run museum that has a bit of everything. It has some curiosities, some thing refer to the hunting of sharks from earlier days and so on. You can visit the shed where the shark is being dried. At the end you get the chance to taste it. But we didn’t like it and I don’t think we will retry shark ever again 🙂 It’s not the best museum but it has it charm. When you have nice weather I would not bother stopping unless you want to try shark, but if you have 1 to 2 hours of rain, it’s ideal to pass the time. When the weather was better we continued our journey and we passed the Kirkjufell mountain which is a 463 m high mountain. It is claimed to be the most photographed mountain in the country. It was not yet great weather so we only saw it while passing by and did not stop. Next on the agenda was the Skarðsvík Beach which is a golden beach which looks amazing against the dramatic black rocks. We wandered a bit on the beach and enjoyed the view before continuing our journey. From the parking lot you can continue following the coast line via very small roads, which is far from ideal with an RV, but we managed to succeed. There is a walk you can do over there, but we only did the first kilometer as the view was rather the same. I remember TripAdvisor promised something more but maybe we went the wrong direction. Anyway, time was running and we didn’t feel lie it. We decided to move on. After a short night we wanted to visit the Londrangar Basalt Cliffs which you can see from on top of the cliffs as they rise above and outside the ocean front. We reached the viewpoint from the parking lot and while heading toward the viewpoint we took one of our coolest pictures according to us. That’s why show this one rather than the picture of the cliffs. Nevertheless we had a great walk enjoying the cliffs, the power of the ocean and once again, being alone in the nature. From the cliffs we rode to Gerduberg Basalt Columns where you see an impressive wall of beautiful basalt columns, forming geometric patterns in the cliffs. You can easily reach the foot of the columns via a short climb through the grass which goes slightly uphill towards the foot of the wall. We would recommend about 30 minutes for this visit and the drive is not too far away from the main road. From here to Reykjavik it takes you about one hour and a half where we arrive shortly after noon. Once we found parking for our RV close to the water we started to explore the city. We had nice weather and headed towards the famous Hallgrimskirkja which is not a traditional church. We visited the church and also paid to visit the tower. From there you can almost see entire Reykjavik. We recommend to do this as well. You easily spend an hour around and inside the church. We continued our day trip in the Main street of Reykjavik which is very nice as it’s car free. You have some shops and some cozy coffee bars where we had some great coffee and cookies. We slept on the parking lot close to the water. It was an affordable solution and almost in the center of Reykjavik. Certainly with an RV it might not be so easy to find a spot. We didn’t want to go to an expensive camping site outside the city. We rent two bikes to explore the city and around. As we were in the end of the tourist season and the weather was not that great the shop was not open. However, after a call with the owner he came along and rented us 2 bikes. This was very much appreciated. With the bike we were able to explore almost entire Reykjavik, certainly after some explanation from the owner and a map we received. You can follow for example a bike bath along the coast line. We went to the national soccer stadium, the beach, some parks, etc… It’s a perfect way to explore the city. In the afternoon we also visited the phallus museum, which is a must do according to us. As you can guess the museum is devoted to phallus of all species. You can for example stand next to the phallus of a whale, which is very very big 🙂 It is good to spend an hour or so. We had to return our RV in the morning before 10:00 and from there we took a taxi towards the hotel. We could drop our luggage in Alex Guesthouse and take the shuttle towards the airport. Our initial idea was to take a bus from the airport towards the The Blue Lagoon but as we were outside peak season the bus hours were not convenient. We could get there, but we had to return very early, already around 14:00. As we had a reservation in the Lava restaurant that left us not much time to enjoy the lagoon and enjoy the lunch. We doubted to go by bus and to hitchhike back, but in the end we decided to rent the cheapest car that we could find which was a Volkswagen Lupo for about 45 euro. Here I should have done some more research upfront as in combination with the “Experience Premium” of 65 euro per person it was quite an expensive afternoon. As I wrote earlier, I would recommend the Myvant Nature Baths instead of the Blue Lagoon as this place is expensive and very touristic. But as it’s that famous, you might want to experience it yourself. If you do so, we really recommend to take the Experience Premium so you don’t have to queue for the entrance, as it is very crowded over there. The people that had no reservation had to wait up to an hour or even till people left the lagoon before they could enter. In our package we also had a reservation in the Lava restaurant (including a sparkling wine), free slippers and a bathrobe. The ticket was 65 euro per person in 2015. I have seen this is already 102 euro in August 2018. 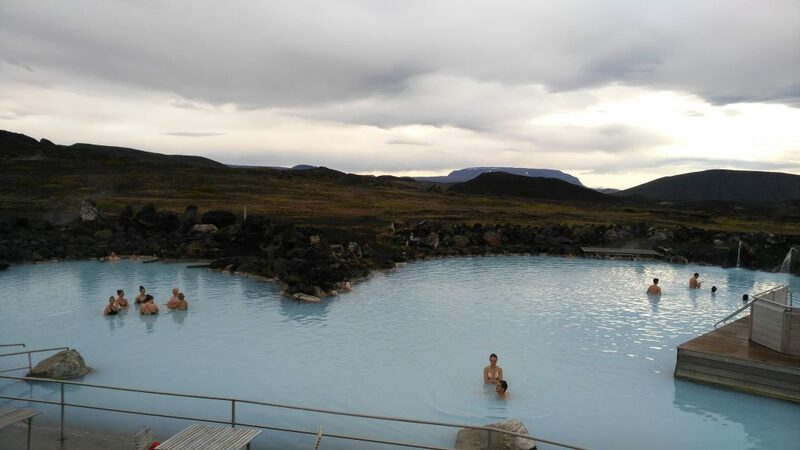 The price for Myvatn Nature Baths is in same period in 2018 around 40 euro. I would know which to take and avoid this tourist place. The food in the Lava restaurant was very good but also very expensive. As it was our last day in Iceland we decided to enjoy it all the way. We returned from the Blue Lagoon to the airport in our Lupo and from there we could take the shuttle towards Alex Guesthouse, as it was included. Alex Guesthouse: We slept our last night back in a hotel. We have chosen Alex Guesthouse because they have a shuttle that runs to the airport which makes it very convenient. We selected a twin room with shared bathroom to keep the price under control. Shower and toilet was clean and enough. It was only for a short night before heading to the airport. We were able to have an early breakfast before heading to the airport. After an early breakfast we were heading to the small airport where all outbound flight leave around the same time. It will be crowded and there is only 1 big queue to drop of luggage. Some people started to stress, but the funny thing was that the personnel was saying this is not the States. The planes will leave when all people have checked-in and the queue is gone, so don’t stress. All went smooth and we landed on time back in Amsterdam from where we took our car back to Belgium.